I would like to share with you some spring activities that the children find fun. We are finishing up our spring unit at school, we had a great time. We always begin our unit with a nature walk around the preschool campus. We are located in a local church and the church’s campus is very conducive to outdoor activities. When we first start our spring discussions we will go outside and look for some new flower blooms, buds on the trees, robins, worms, bugs, and the forsythia bush. The children have a great time because it is usually our first time outside in quite a while. Getting your preschooler out to look at the newness around them is great for everybody. We usually follow up our walk with a planting. Great fun! The kids just love to get in the dirt. We usually always plant in stryofoam cups. I have a pack of marigold or zinnia seeds and we look at the seeds to get an idea of what we are starting from. The children throw in some dirt, a few seeds, and water. Then we cover them in plastic and wait. You can not imagine the wonderment on their faces when they come back to school and see those shoots coming out of the dirt. Planting is always fun and easy for children. At home I have a small garden that my preschooler loves to help me with. If you can’t plant an outside garden, plant some flowers in cups, get a small window box and throw in some dirt and seeds. Another planting activity I have seen which is cute, is to take half of an eggshell, draw a little face on it, throw in some dirt and grass seed and create some egg people. It may seem trivial, but they love it. You don’t have to go all out to impress a preschooler. Sometimes the less fuss, the more fun. A trip to a local nursery is great fun for the children too. We go and look at all the beautiful plants, and flowers. It’s fun because we get to see what our plants will look like when they grow big, and we also get to see some plants that are new to us. Some other activities that may take place during this unit are: making forsythia plants, the children use markers and yellow and green tissue paper. The children will draw some branches with their markers, then crumble some tissue paper and glue them to the branches. We also make some pussywillow bushes, again using markers to make branches and then we mix some gray paint, but you can also use a stamp pad. We have the children make the pussywillows with their thumbprints. We always paint a beautiful garden of flowers also to emphasize all the beautiful colors that arrive in spring. Children’s handprints can be used for many different crafts during the year. 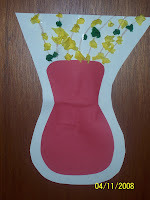 A robin or a flower can be a spring handprint creation. For the flower the children would paint a green stem then we paint their hand with their choice of color, and then press the hand on the paper. 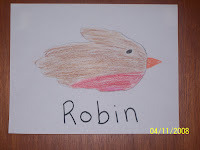 The robin involves tracing the child’s handprint horizontally. The thumb is the top—like a wing, and the fingers are the back wings. An eye is drawn near the top of the palm curve, in front of the thumb, and then the bottom of the palm is colored orange for his orange belly. Oh, and don’t forget the beak. The rest of the bird is colored brown. All these activities are ones that you can share with your preschooler during our wonderful season of spring.